Please join us for the blessing and dedication of a new statue of Mary on Monday, April 22nd at 4:00 pm. The statue is a memorial gift honoring the work of Sister Karen Stern, SHF who served the people of St. Mary’s from 1992-2001. The statue, to be located outside the preschool classroom in the parish center, depicts Mary as an old wizened woman, the Seat of Wisdom, one of the ancient titles of Mary found in the Marian Litany. For centuries Mary was sometimes depicted as an old woman, a smile on her face, her arms extended with open hands and feet planted firmly on the dais. The Child is depicted either seated on her lap or centered on her body. Jesus, the eternal Wisdom of God, was first nestled in her womb, and as a child, was visible for all to see. Her open arms echo her ongoing openness to God's call, her empty lap invites children to come and be embraced by the Wisdom of God. 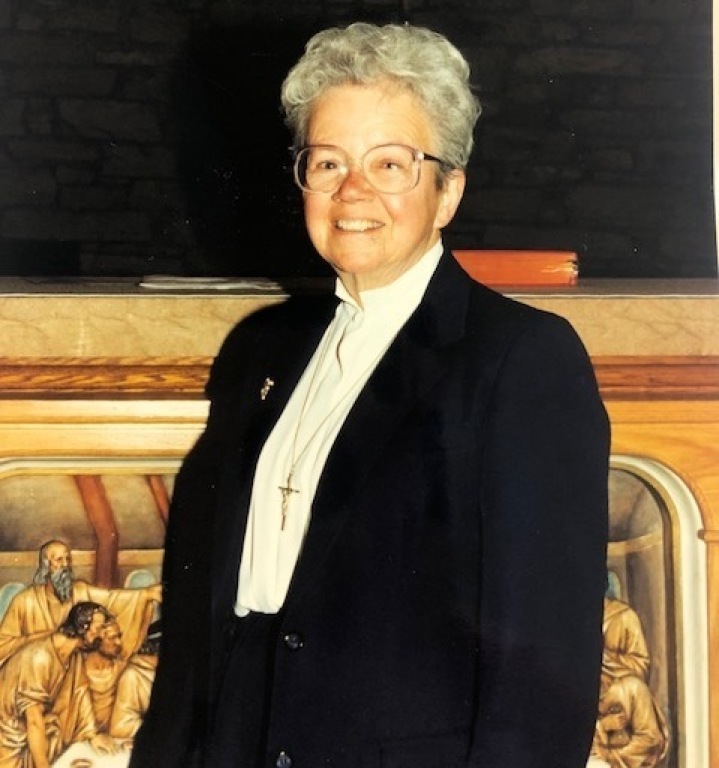 Sister Karen Stern was much beloved by the children of St. Mary’s and their parents. She worked tirelessly sharing God’s love and kindness. As the director of religious education, she prepared our catechists as teachers, taught new parents about holiness, and saw only the goodness of their children. Her special care of elderly shut-ins reminded us all of the goodness of those rarely seen in public. And she stood in the gathering space at every Mass to welcome the stranger and, at the end of Mass to embrace the children. Not a few parishioners also recall getting “the look” if they left Mass early. A sin never to be repeated. To this day the excellence of our religious education programming, our annual Christmas pageant, and the songs that accompany the pageant are all reminders of the legacy of love that she left us. In 2001Sister Karen suffered a major stroke. Parishioners were greatly concerned about her health care and future retirement. Tens of thousands dollars were raised for her benefit. When it became apparent that her immediate health needs were more than adequately covered, the monies were deposited in the Catholic Foundation for her future needs. In 2017 Sister Karen requested and was granted $50,000 for her community's new retirement home. She died of ovarian cancer the following year. $60,000 in residual monies remained. The directors of the fund allocated $30,000 for a commemorative memorial in her name at St. Mary’s. The remainder of the funds are directed to be expended at the pastor’s discretion for the children of St. Mary’s. All are invited to the dedication and blessing of the memorial statue on Monday afternoon at 4:00 in the Parish Center!